Several top players in the generic injectables market are focusing on mergers and acquisitions to consolidate their shares. They are also making substantial investment in research and development activities with an aim to develop new products, in order to gain an edge over their competitors, notes Transparency Market Research (TMR). Some of the companies holding leading positions in the market are Biocon Limited, Sanofi, Lupin Ltd., Hikma Pharmaceuticals, Teva Pharmaceutical Industries Ltd., Mylan N.V., Fresenius SE & Co. KGaA, Baxter, Novartis AG (Sandoz International GmbH), and Pfizer Inc.A growing number of producers of generic injectables are focusing on products that meet the highest standard of efficacy and safety as that of the originator products. 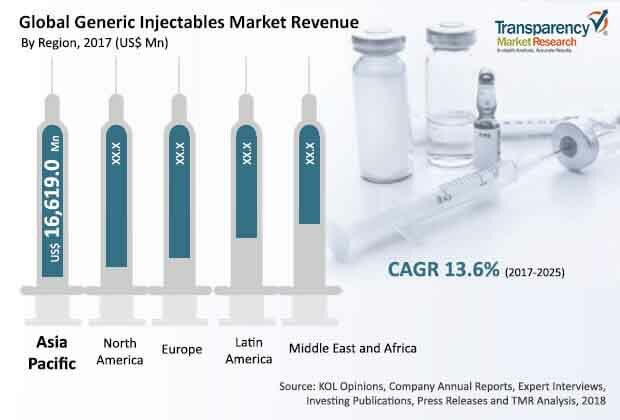 The global generic injectables market is projected to expand rapidly from its worth of US$ 49.0 billion in 2016 to reach a worth of over US$ 150 billion by 2025. This represents a robust CAGR of nearly 13.6% during the forecast period of 2017–2025. The various product types can be grouped into ampoules, vials, premixes, and prefilled syringes. Of all the segments, the market for prefilled syringes is expected to rise at the most attractive CAGR during the assessment period. The higher precision of dose, ease of self-administration, and reduced wastage of products are some of the compelling benefits accounting for their widespread acceptance. Regionally, Asia Pacific led the global market in 2016 with substantial uptake of generic injectables among patient populations. The regional market is anticipated to rise at a rapid pace, attributed to the widespread demand for affordable therapeutics and sustained governmental thrust in key economies. The continued drive for generic injectable gains strength from the pressing need for quality therapeutics at affordable prices among patient populations world over, amid the soaring healthcare cost. The loss of patents for various blockbuster biological molecules in the years to come, coupled with the broadening acceptance of biologics, is a notable aspect propelling the demand for generic injectables. Spiraling spending on research and development of biologics is providing a large impetus to the growth of the market. Efforts to bring constant innovation in drug delivery mechanism for injectables are catalyzing the demand for generic injectables. In this regard, the widespread acceptance of prefilled syringes among healthcare workers and patient populations at large is providing a robust impetus to the market’s growth. The number of attractive benefits drug delivery method has with the use of prefilled syringes has bolstered their uptake in parenteral drug delivery across the globe. Furthermore, constant technological advances in drug delivery systems, especially in developed countries, is notably accentuating the growth of the market. Recent advances in the delivery mechanism of complex therapeutic molecules has imparted a noticeable momentum to the market’s growth. However, the market also suffers from certain setbacks. The high cost of investment required for setting manufacturing plants has constrained the entry of new players. Furthermore, a stringent regulatory framework with respect to large molecule generic injectables in developed countries, such as the U.S., is also hindering the market’s growth. Nevertheless, the rapidly rising demand for lower-cost generic versions of vital medications among clinicians and patients will continue adding to the global revenues. A number of manufacturers or producers are putting their focus toward the area of oncology therapeutics. To this end, prominent players are making sizeable investment in R&D in oncology biosimilars to be delivered in injectable form. This will provide sustained fillip to the growth of the market over the forecast period. The rising demand for affordable quality therapeutics to be delivered in injectable form is driving the market. Substantial spending on research and development in oncology therapeutics and other large complex biological molecules to be delivered in injectable form will unlock promising prospects.